Add value or order monthly subway passes online. Get a Monthly LinkPass that renews automatically. 1-day and 7-day passes purchased on CharlieTickets are valid from the date and time of purchase. Those purchased on CharlieCards are valid from the first tap into a subway station. Unlimited travel for 7 days. CharlieCards are reusable plastic cards that can be loaded with cash value or 1-Day, 7-Day, or monthly passes. The right way to pay for you depends on which modes you want to take, and how often. You can also pay in cash on buses and at street level trolley stops. You can buy or renew 1-day, 7-day, cash value, and monthly passes on CharlieTickets and CharlieCards at fare vending machines. They are located at all subway stations and at the Lynn and Worcester/Union Commuter Rail stations. Most machines accept cash and major credit/debit cards. Some machines only accept credit/debit cards and are marked to indicate they don’t accept cash. At street-level trolley stops, you can add up to $20 cash value to a CharlieCard or CharlieTicket at the onboard fare boxes. At select stores throughout Greater Boston and Providence, you can get a CharlieCard and load it with cash value or a pass. You can also add passes to a CharlieCard or CharlieTicket you already have. Cash and credit/debit cards are accepted. When you register for a MyCharlie account, you can add cash value and passes to your CharlieCard online. We recommend registering for a MyCharlie account to protect your card if it is lost, stolen, or damaged. You can also sign up for Auto-pay, a monthly LinkPass that automatically renews each month. To enter subway stations, tap your card on the fare gate target. At street-level trolley stops, tap your card on the fare box near the front door of the trolley to board. To enter subway stations, put your CharlieTicket into the slot on the fare gate with the orange arrow facing up and away from you. At street-level trolley stops, put your ticket into the onboard fare box with the orange arrow facing up and away from you. 1 beep means your CharlieCard fare was paid. 2 beeps means your CharlieTicket fare was paid. 3 beeps means that the machine was not able to read your ticket or that there wasn’t enough money to pay the fare. 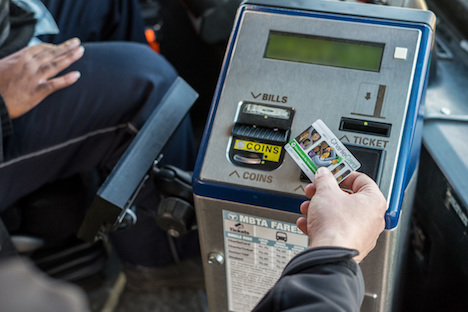 You can try again or visit a fare vending machine to reload your ticket or pass. 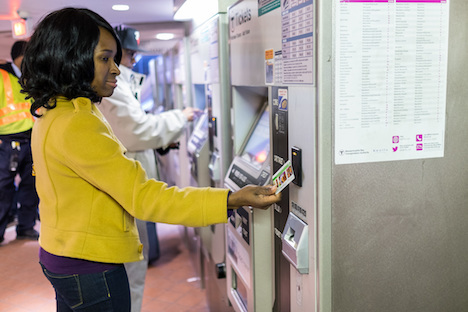 At street-level Green Line and Mattapan Trolley stops, you can add cash value to your CharlieCard or CharlieTicket with coins or bills, up to $20. You cannot buy or reload 1-day, 7-day, or monthly passes at onboard fareboxes. Tell the driver you need to add value to your CharlieCard or CharlieTicket. Press the white button in the upper right corner on the fare box. Tap your CharlieCard on the farebox target, or insert your CharlieTicket into the machine with the orange arrow facing up and away from you. Insert cash or coins up to your desired value. Change is not returned from onboard fare boxes, so any cash you insert will be loaded onto the card or ticket. Press the white button again. Tap your CharlieCard to complete the transaction, or remove your CharlieTicket from the machine. Tap your CharlieCard or insert your CharlieTicket 1 more time to pay your fare. At street-level Green Line and Mattapan Trolley stops, you can pay your fare in cash with coins or bills, up to $20. To pay your fare, tell the driver you are paying in cash, and insert the amount displayed on the fare box. Tip! If you pay more than $0.25 over the required one-way fare, the change will be returned on a CharlieTicket. You can then use it to pay your fare on another mode of transit, or reload it at a fare box or fare vending machine. Some customers are eligible for discounted prices or can ride the MBTA for free.